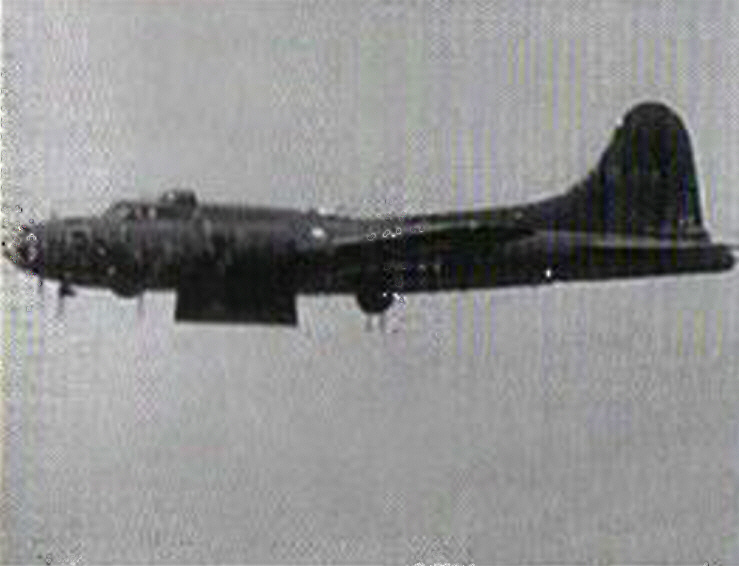 Sent by Tom Dow, who writes, "Photo of B-17 # 41-24356 taken on 03 March 1943 during the Battle of the Bismarck Sea, at approximately 10:30 a.m., from a photographer aboard B-17 # 41-24358 "Lulu Belle." Photo originally supplied by Roger Vargas, who told me that they "just happened to have a photographer aboard" on that mission. As you know, Ka-Puhio-Wela (Double Trouble) was the only heavy lost during that battle. In this photo, fire is visible as a bright light in the radio compartment. The pilot, 1st Lt. Woodrow W. Moore, and the co-pilot, 2nd Lt. Louis I. Miller are visible in the cockpit. Aircraft was hit in the radio tank, and it broke apart at Station 6 at varying reports of 300, 500 and 1000 feet. This photo was taken from approximately 7,500 feet. Some of the crew bailed out at approximately 5,000 feet and were strafed by Zeros. We don't know who else bailed after this photo was taken, if any, but the officers got the Silver Star. The others got the Air Medal..."